Collagen constitutes 30% of the total human protein mass. It is responsible for skin firmness, elasticity, proper moisture and constant renovation of skin cells. Collagen deficit increases with age, causing i.a. skin wrinkling. The trials to use, initially synthetic and later bovine collagen, in cosmetics and implantology brought only partial success, mainly due to the fact that so far no biologically active collagen with the structure of amino acid chains identical to human has been developed. Such collagen has been developed in Poland ! The epoch-making discovery of the scientists of the University of Gdansk was a great sensation in the cosmetic industry of the 90-ties. However, it could not be used in practice because of the problems with maintaining full values of the obtained extract in uncooled conditions. The unique formula of natural collagen Q 5-26 was mastered by Inventia Polish Technologies labolatory assistants who developed the first cosmetic product in world based on fish collagen. This product possesses epidermis repair properties and does not lose the key to its secret i.e. triple helix, at room temperatures. The collagen is obtained from skins of the noblest fish fished in natural reservoirs and filtered through silk fibroins. The entirely natural preparation, without any colouring and aromatic additives, constitutes a few percent component of several exlusive creams currently launched by leading cosmetic manufacturers. You are getting a unique product containing several times higher quantity of pure collagen than most expensive cosmetic products in world. Our collagen met with enthusiastic approval of medical specialists, because of its ability to renovate wrinkled epidermis cells, which is breakthrough in the cosmetic industry. The preparation has undergone strict, long-term clinical test in several countries at the same time. It is non-allergenic and non-irritant. It does not cause skin addiction. It does not have any undesirable side effects. It is not often that such exceptional products are launched on the market, especially ones based on the discovery of Polish scientists. The importance of this discovery cannot be overestimated. Flooded with commercials of various, miraculous elixirs, especially aggresive in the cosmetic industry and medicine, you may find in hard to belive that it is the fish collagen that is going to stop the skin ageing process. It is even more difficult to believe that it was discovered in Poland. This is what actually happend. You will be able to test this product literally on your skin ! The collagen production technology allowing collagen to maintain the triple helix, was nearly sold to a certain potentate on exclusive rights. It would come back to us in the form of very expensive brand cosmetics. Meanwhile, we have a great hit on the market. Everyone who comes across this product has a unique chance to use it to built own business. It has been said for years that companies selling an effective drug for potency, obesity, baldness, dandruff and.... wrinkles will strike the gold. We are giving you such chance. Big money that we would have to spend on media promotion campaign of the Natural Collagen, we are designating entirely to discounts and commission for all who will join us in building multi-level distribution network of this product. Most probably, there has never been a product of similar potential in direct distribution. Collagen defends itself easily. It sells easily, as it has the best possible advertising, that is growing number of users. We suggest you make use of this phenomenon. Those who join us in building our still young network, can expect great personal and financial success. Colway is a very friendly network, free from many disadvantages of similar businesses. There are no starters, licenses, etc. There is no need to make any investments to start with us. This business has been designed both for people who just want to earn extra money and for those who want to earn several dozens of thousands. Recommended mainly for face, neckline and other delicate body parts treatment. Effective in revitalising treatment of mature, non-invasive face lifting, after plastic surgery operations. Can also be used after mechanical skin cleaning, sunbathing and as mask and make-up foundation. Recommended for entire body treatment. For healing and energising massage, after hair removal, sun beds, peelings. Excellent in all at-home skin and joint treatments. 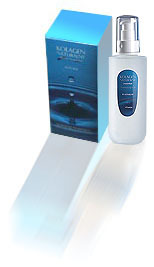 Popular with hairdresser's and nail studios as more economical. Used for 15-minute application on hair, rough skin and home baths at 30-50ml per bathtub, especially together with pearl bath with ozone. Note! The preparation maintains the same properties and the same structure of amino acid chains with intact structure of collagen fibres at all stages of final purification. called the extracellular matrix (ECM), also referred to as the 'intercellular matrix'. complicated proteins that align themselves to make up a semi-ordered network in the intercellular space. The network they form is not impermeable, however it allows amino acids and larger peptide subunits to move through it freely. The ECM significantly affects the location, development, proliferation, organization and metabolism of the cells it surrounds, and plays a vital monitoring role during the transformation of these cells into tissue.